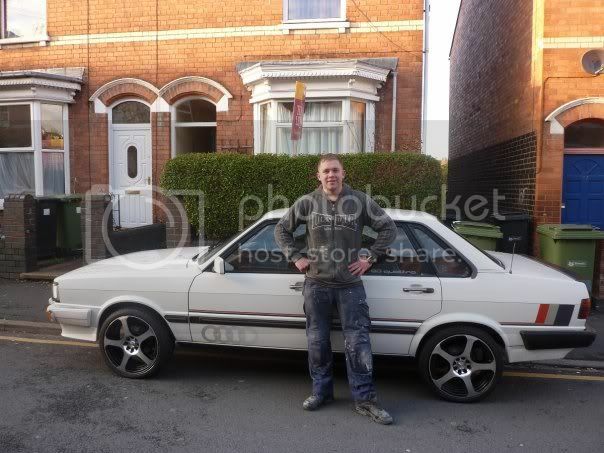 Classic Audi » Classifieds section » Cars For Sale » 1983 audi 80 quattro for sale!!! 1983 audi 80 quattro for sale!!! A rare opportunity to buy one of the 957 manufactured Audi 80 Quatro in sought after white. In July 2009 i purchased this amazing car with the original 2.1 litre 5 cylinder engine with front and rear diff lock controller. It has PAS, electric front windows and central locking all in working order. An elderly lady had owned this car for 25 years and bought it when it was a year old in 1984 for around £9000. The car became a beloved member of her family, was kept in top mechanical order and garaged. Mileage of 134,000 means that an average of only 5100 miles a year was clocked! The lady was literally in tears to see it go when I collected it. I took the car straight to my bodyworker/mechanic who replaced the wings and replated the sills, rear arches and valance. All the paintwork is original apart from the respray of the replacement wings and sills. To get it through the MOT he fitted new rear disc brakes and pads, a new handbrake cable and rear brake caliper. I treated it to a full Powerflow stainless steel exhaust system, copied from the original with twin slash cut back box. This comes with a life-time guarantee. The car comes with 14" Ronal alloys, tyres with good tread and the original steels and hubcaps. Inside the roof and back seat look brand new but the front seats come with usual bolster-wear. If I can't get hold of replacements, that will have to be the quest of the new owner. There is a slight ripple in the rear drivers side door which can be rollered out. Also the housing around the indicator and foglights on the front bumper is slightly cracked but is still intact. The car looks spectacular and is drawing a lot of attention. After driving this car for less than a month I greatly regret having to part with it. Having just being made redundant i cannot afford the luxury of keeping this car. I am consequently looking for a new owner who can fully appreciate what a gem this is. I havn't had a chance to polish it recently so the photo's will be up in a couple of days. Meanwhile anyone interested can contact me on here if they have questions. Best price secures the car, so give me an indication of what you will be willing to pay. Serious enquiries only please. I would prefer to sell it to an Audi enthusiast but price is important and i would rather not resort to ebay to attain the price i need. 2) Please give a guide price. There are plenty of auction sites out there! If you wish to sell you car or a part, please could you state clearly a price which you have in mind. Could be interested in this depending on price. What sort of figure are you looking for? there could be a few people interested in this, but the price is the big question!! and it's a question which we could do with an answer to quickly me thinks, followed by half a dozen pictures of said car!! Yep, photos would be nice as well. This one sounds like it might be a bit too nice for what I have planned/my budget, but I'm very interested none the less. Hi guys thanks for your interest so far. This car owes me back £3700 from what i have spent on it already. so any sensible offers above that i will consider! Pix will be up in the next day or so. Thanks, as I expected out of my budget, best of luck with the sale. I look forward to the pics.